You are currently browsing the archive for the MARCHFOURTH MARCHING BAND category. MarchFourth Marching Band is a mobile big band spectacular, consisting of a 12-piece horn section (4 saxophones, 4 trombones, 4 trumpets), a 10-piece drum/percussion corps, anchored by electric bass (battery powered). It all began when a handful of artists and musicians in Portland, OR decided to put together a marching band for a Fat Tuesday Mardi Gras party on March 4th. The sound is huge, melodic, and dynamic, taking audiences on a musical journey around the globe. 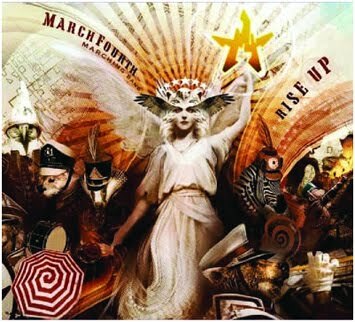 MarchFourth writes and performs its own material, and also draws inspiration from an eclectic range of worldwide influences, such as Eastern European Gypsy Brass, Samba, Funk, Afro-Beat, Big-Band, Jazz, and Rock music, as well as television, film, circus, and Vaudeville. has been available online at CDBaby.